Nintendo has unveiled its new Nintendo Fan Network in Seattle, a wireless service that brings a digital experience to fans of the city's Mariners baseball team. The games company - whose US headquarters are in Seattle - will lend 150 new Nintendo DSi consoles to spectators at each game for free, loaded with the Nintendo Fan Network application. 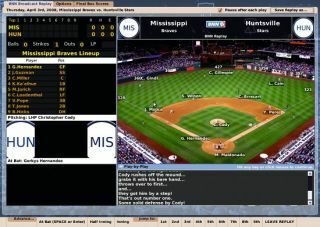 The Wi-Fi service offers live video broadcast (including replays), interactive trivia and games, as well as real-time scores of other baseball games in progress. The Nintendo Fan Network also offers live weather and traffic information, and the unique ability to order food and drink for delivery directly to the fan's seat, all with a tap of the stylus on the Nintendo DSi touchscreen. New for this season is up-to-the-minute news and analysis from ESPN, as well as subtitle display of live commentary. The Network can be accessed for free on any Nintendo DS handheld, for the duration of each home game. John Zehr, Senior Vice President at ESPN said,"Our collaboration with the Nintendo Fan Network is a direct extension of the ESPN mission to enliven the sports experience, no matter how or where fans are consuming sports."